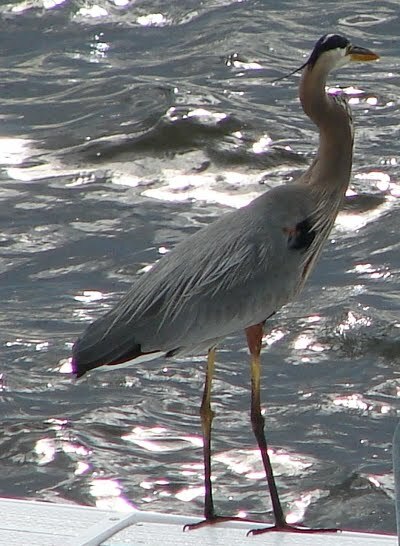 I’m fascinated with Great Blue Herons. Even with their gangling, stork-like legs, they are absolutely gorgeous creatures . . . at least my daughter, Amy, and I think they are. Their mix of smooth and shaggy feathers, their long, curved necks and splotches of vibrant colors reminds me of exotic oriental paintings on silk scrolls . . . an image that seems too fancy for the lakes, streams and tidal pools they frequent. As I study them, I think of people who feel out of place–people who just don’t seem to “fit in” with their surroundings, and yet, someone thinks they are perfect. Not just anyone, but Someone who knows them and knows what they are capable of achieving. Someone who can see the “beautiful” inside them and loves them for who they are, gangling legs and all. Someone who knows that if they didn’t have those long legs, they wouldn’t be able to wade deeper into the “water”. Psalm 139:14 “I thank You, because I am awesomely made, wonderfully; Your works are wonders–I know this very well.” from the complete Jewish Bible.